Encinitas, CA -- It will cost $5,600 - $5,800 that we DO NOT have in our medical fund, but Rancho Coastal Humane Society in Encinitas is taking a leap of faith and has scheduled hip replacement surgery for "Koa." Koa is a 1-1/2 year old German Shepherd mix that arrived through the RCHS - Friends of County Animal Shelters program. Donations are being accepted to pay for a new left hip. "Every dollar counts for most non-profit animal shelters," says RCHS spokesman John Van Zante. "Spending $5,600 to $5,800 that we don't have in our medical fund is a real leap of faith. But if we don't take this leap, this dog will never leap again. We need help." Koa has severe hip dysplasia... a condition where the ball of the femur bone does not fit properly into the hip socket. This allows the ball to slip in and out of joint. Van Zante says, "Koa showed typical symptoms. He was very stiff after taking naps. Even a short, slow walk could leave him with a limp in his hind legs. RCHS Medical Director Kathy Zerkle ordered tests and X-rays that confirmed her suspicions." While there's no "cure" for hip dysplasia, in many cases it can be managed with a combination of proper diet or weight loss and medication. Unfortunately, that's not an option with Koa. Hip replacement surgery is his only hope. "Koa loves adults and children. He loves other dogs and they love him," says Van Zante. "Once he recovers from his surgery, his new family is going to be so blessed. They'll still need to monitor him and make sure he doesn't get too heavy. But his prognosis is good." Koa's hip replacement surgery is scheduled for February 6. He'll need about 6 weeks of recovery time. Anyone interested in adopting Koa or helping to pay for his hip replacement surgery is asked to call RCHS at 760-753-6413, visit the shelter at 389 Requeza Street in Encinitas, or log on to www.sdpets.org. 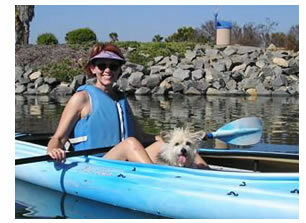 Dog Paddles: Family Kayak with your Dog! 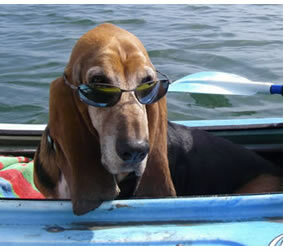 Summer is just around the corner and it is time to get our 4-legged friends outside for some kayaking. Yes, Dog Paddles are the latest way to bring the whole family out for some water fun. We work with all breeds and temperaments. Some dogs love the water and we teach them how to stay IN the kayak. Some dogs are afraid of the water and we teach them how to be comfortable around the water and in the kayak. Some dogs have never had an opportunity to be around the water, so they get to find out how much fun it can be. We start with on land instruction and then take an easy paddle around Mission Bay. Then we make a pit stop at Fiesta Island for a quick romp and some exercise. Then we launch again for our trip back to the launch area. Family Kayak makes it easy for you to go out for a paddle. We provide the kayaks, life vests, paddles and safety equipment plus an ACA certified kayak instructor. No previous kayaking or swimming experience is required for the humans or canines. We use stable, roomy kayaks that can accommodate any size dog. The kayaks can be set up for one or two human paddlers and one or two canines. Each kayak can hold up to 500 lbs. Cost is $42 per adult, $17 per child (2-14 years of age), $10 per dog for each private session. If you have a group of friends with dogs that already know each other, we are happy to put together a group lesson. Give us a call for group discounts.